I'm absolutely thrilled to be participating in the blog tour for CURSED, the fourth installment in Thomas Enger's exceptional Henning Juul series. You might recognize Enger's name from my previous coverage of his series - I had the pleasure of interviewing Thomas at Iceland Noir this past fall, and have absolutely loved books 1 and 2 in the series, BURNED and PIERCED. Before I dive into this review, I owe a huge thank-you to Thomas' publisher, Karen Sullivan of Orenda Books, for allowing me to provide a quote for the jacket of CURSED! 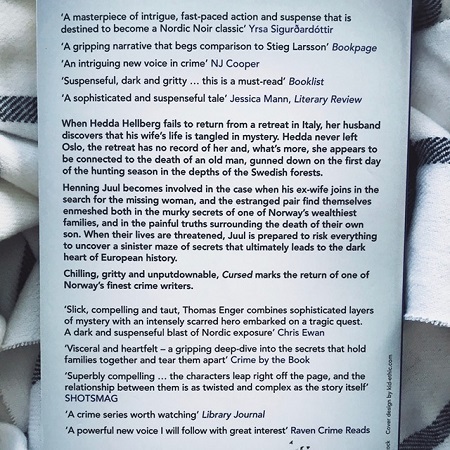 This is a total dream come true - I absolutely love this series and am so honored to be quoted on the back cover of the newest Henning Juul book. Sometimes if you're lucky, you stumble upon an author whose books just completely mesh with your personal style as a reader. Each Thomas Enger book I read reinforces that he is exactly that kind of author for me. His characters leap off the page, his writing is taught, and his plots are relentlessly paced. In short, his books have been instant-favorites for me, and CURSED is no exception. In this new series installment, Enger turns his keen eye inward, examining the interpersonal fallout of lies and deception. CURSED centers around one of Norway's wealthiest families, drawing the reader into a mysterious disappearance with far-reaching implications. When Hedda Hellberg fails to return from a retreat in Italy, her husband discovers that he knows much less about his wife than he thought... and that her disappearance might be connected to the death of an old man, gunned down in a Swedish forest. Henning Juul and his ex-wife Nora are soon drawn into the search for the missing woman—and at the same time, find themselves closer to the painful truth surrounding the death of their young son. CURSED is a chilling minefield of secrets and lies—a maze that Henning must navigate on his tragic journey to learn the truth about his son's death. My favorite aspect of Enger's writing has consistently been his ability to write about people. Enger is at his best when he explores the inner workings of a character's mind: what makes them tick, what motivates them, what their weaknesses are. CURSED puts this talent on full display. I've loved Henning Juul since Book 1 (BURNED), but CURSED brought me even deeper into his mind, and reduced me to tears as I witnessed Henning's commitment to finding justice for his deceased son. I felt as though Henning was a real person, there in the room with me as I read. CURSED truly is character-driven crime writing at its finest—I dare you to read this book and not find your heart fully invested in the well-being of its endearing protagonists. Enger does something a bit different in CURSED: he shifts his focus to include more chapters dedicated to Nora, Henning's ex-wife. While it's no secret that Henning will always be my favorite part of this series, I absolutely loved that Enger takes the time to fully develop Nora's character. I wholly enjoyed getting to know her better—and I was thrilled to discover that getting to know Nora actually gave me a fuller sense of Henning, too. I felt as though I was getting a 360-degree understanding of our main character in a way that just isn't possible without getting to know the characters close to him. Henning and Nora's story is tragic and compelling and utterly heartbreaking—and I loved the added emotional depth that comes with Nora's prominent role in this story. Beyond its vivid and engaging characterization, the plot of CURSED hits the perfect balance between the grit of Nordic Noir and the domestic suspense that is so popular. That's not to say CURSED is a domestic thriller—its pacing and tone are Nordic Noir, through and through. But this story does have a touch of Harlan Coben-like family secrets to it (if you're a Coben fan, you'll know exactly what I mean! )—it has a plot that's more a web of secrets than a linear mystery. 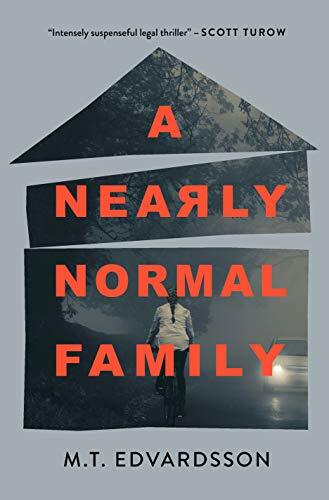 It draws the reader deeper and deeper into its core, examining how the secrets that family members keep from one another can have lasting and tragic fallout. CURSED is the kind of mystery you can wrap yourself up in—it has a quiet urgency that builds over the course of the book, culminating in an utterly killer ending that left me literally gasping out loud. Enger just gets better and better with each series installment: CURSED shows a delicacy and mastery that somehow made me feel personally involved in its story, as though I were living it along with its characters. I read this book in two sittings—I simply couldn't extricate myself from the vivid and emotional world that Enger has built in this novel. Thomas Enger's series reminds me why I love to read crime books. Its pacing is completely addictive, its characters are endearing and vivid, and it has that special something that makes me just plain happy to be reading. Scandinavian crime readers: Enger simply must be next on your reading list. Readers of any other kind of crime fiction: he should be your next read, too. CURSED might be part of a series, but it's not necessary to read the previous Henning Juul books before diving into this one—although I can practically guarantee that you'll want to after you've finished CURSED. A huge thank-you to Karen Sullivan of Orenda Books for her huge generosity, not only in allowing me to participate in this blog tour, but also in allowing me to be quoted on the jacket of a book I love so much! Follow along with the CURSED blog tour!